For centuries, traditional church architecture has been pregnant with meaning and symbolism. The building itself, from interior to exterior, is meant to carry a visual message that transcends language. This is why art and aesthetics play an uncompromising role in traditional church architectural planning: because they help to convey the truth of that ancient message. The traditions are upheld by creating spiritually (and aesthetically) rich environments through the use of symbolism and focal points – ornate crosses, stained glass windows, and so on. When our acoustical engineers and audio-visual design consultants (many of whom are dedicated church members and volunteers themselves) meet with churches leaders to discuss their needs, there always seems to be some tension between art and audio. So, which should take priority? The truth is that art and audio both need to be an uncompromising priority in traditional church architecture. Indeed, the message flows from both. What good is pristine sound and acoustics (ie: clear communication of the spoken word and music) if the building itself is sending a different message? And what good is a glorious cathedral (ie: a rich visual and spiritual environment) if the person in the pew cannot understand what is being said or sung? Clearly, both art and audio are vital in communicating the message. So, can it be done? The answer is yes. It is possible to design (or renovate) a traditional worship environment that is rich with great art and great audio. 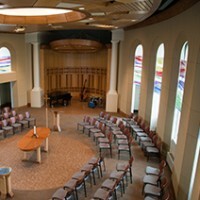 As an independent acoustical consulting firm, our job is to help churches in the planning process. We make sure the acoustics and audio-visual system will aid in the communication of the message without detracting from the overall worship environment. And we are uniquely positioned to help churches in this regard. Since we do not sell AV equipment or represent any product lines, we are free to offer recommendations that are best suited for the situation. Again, we do not seek to outfit churches with the biggest and the best AV systems; rather, we seek to give unbiased advice on how to best meet the goals of the church. There need not be a “battle” between art and audio in traditional church architecture. No one should be forced to choose between great aesthetics and great acoustics. Both should be properly addressed and planned for from day one. I wish I had found this site before because it is great! Hi i just thought I should leave a bit of feedback as i very much likeyour site its so interesting, keep it up!